Salty is a well built dog with good length of leg , level top line, an excellent front and strong hind quarters. He is a deep coppery red which he has passed on to each litter he has sired. Salty weights 48 lbs., stands 20” and is medium boned. He is extremely birdy, an excellent marker and shows lots of courage when working. 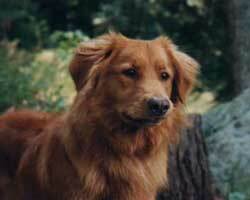 As well, he is a fun-loving fellow who always enjoys any kind of retrieving. Salty is the sire of Redland’s The “A” Litter, The “B” Litter and The “D” Litter. In addition he has sired a litter for each of the following kennels including Bernache, Berdia, Lennoxlove, Foxgrove, Kylador, Kare, Foxwatson and Seabright . Gibby is a mellow fellow, always willing to play and please. He is about 19.5” tall and weighs about 40 lbs. 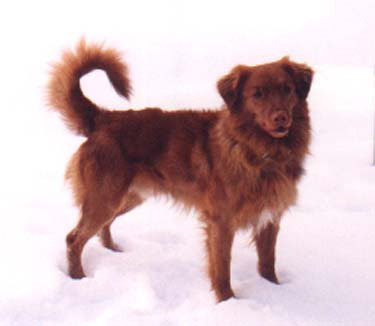 He has a golden red coat of medium length and the light pigment nose and amber eyes. Gibby has taken a number of obedience classes, has had basic Agility training and when time permits (for his owner, Sandy) he will start to do some field work. He is a great companion with a super temperament and loves to play any form of fetch. Gibby is the sire of Redland’s The “F” Litter. Foggy is a very special fellow. He came to us in December of 1999 when Harbourlights Kennels was dissolved and has adapted well to life at Redland Kennels. He is about 19 “ and weighs 40 lbs. His white markings are striking and his temperament is mellow and biddable. He really wants to please. He is an energetic fellow and an avid retriever. Foggy has now successfully completed a set of novice obedience classes and his training in this area will continue with a view to working towards his CD. 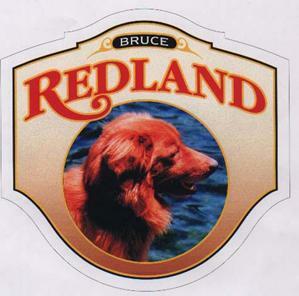 Foggy is the sire of Redland’s The “C” Litter.